There is a particular family of creation myths, emerging out of different cultures all over the world, from the Americas to India to the ancient lands of Central Europe, whose stories loop back and back again to a common center. The universe, they all say, was once a vast, primordial ocean. When things began there was no land upon which to rest a weary foot, no earth where trees could grow, no rocky mountains to break the droning plane of the sea. The sky was all there was above, and water was all there was below, and the animals ached for a world entire. And so, one creature—sometimes a duck, sometimes a turtle, sometimes a beaver or our old trickster friend coyote—was sent by the others to dive deep, deep, deep below the dark waves to bring up some earth with which to build a world. But the task was too perilous, and the first emissary perished before it could swim far enough down, or else returned to the surface of the water empty-handed and half-dead from exhaustion and breathlessness. It had to go again, or let another go in its stead. This went on, the stories say, for some long while, and discouragement fell upon the creatures of the universe. But then a piece of luck came along. After the third or fourth or fifth grueling dive, a few nearly invisible grains of sand were finally discovered tucked beneath the nails of the one who was the last to descend—the one who without even noticing had scraped against the bottom of the ocean floor. From these specks—this grist—the whole world was formed. Ross can’t stand sand, for exactly the reason that it is able to play such an important role in these mythic landscapes. Sand clings to you, he complains, embeds itself in crevices, lodges between nails and skin. Light enough to travel, it blows into your hair; heavy enough to settle, it accumulates inside shoes. In general, Ross tolerates sand for the sake of the sea. Last weekend, it was the promise of open skies and a roaring fire that allowed him to rise above this deeply rooted prejudice. We hopped in a rental car, tucked two little-used sleeping bags in its trunk, and drove some 75 miles east and north along the smooth curve of the great Lake Michigan to reach the sandy slopes of Warren Dunes State Park in Sawyer, Michigan. 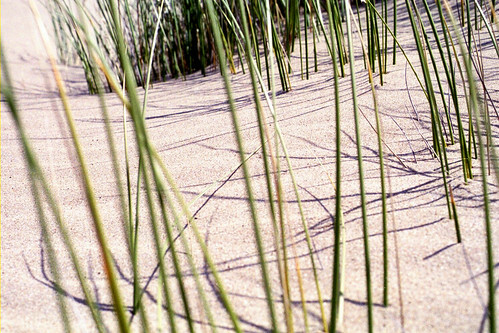 Michigan is piled high with sand dunes that have formed along the shores of the lake: in all, over 275,000 acres, or nearly one percent of the total land area of the state, is covered in the grassy up and down terrain of dune formations. We drove all that way so that we could go camping in the shadow of several of those dunes. And while we were there, scrambling step by slippery step up a sand dune as steep as a cliff and digging our toes into the cool, crumbling sand of the beach (or at least my toes; Ross’s stayed safe inside his socks), I realized that not only did I not know how a sand dune forms, or what brings a beach into being—I barely understood the source of sand itself. What was it made of? What forces created it, and how far had it traveled, if at all, to come here? I had no knowledge, in any deep way, of the nature of what I was standing on. In case this describes you as surely as it did me last Saturday, I thought I’d share with you the things I’ve gathered since. This is how it goes. It turns out that the definition of sand is, like the substance itself, a little fluid. The American Heritage Dictionary claims sand consists of “small, loose grains of worn or disintegrated rock.” But how small is small? Wonderfully, there is an official sedimentologist-approved range, which is precisely 0.0625 to 2.0 millimeters in diameter. It may not sound like it, but that allows for a tremendous variety of amplitudes. Sand is not composed of a uniformity of pretty, machined beads, each identical to the next: it is pinprick small; splinter-small; tiny shard of broken shotglass-small; small as a cumin seed; small as the ovary in a female Sora found in the fall. It occurs to me that a handful of sand is, in this one odd way, like the sixth grade classes I once taught, tumbling between childhood and adolescence: some sweet faces so tiny you could still cup their whole cheek in one palm, some stretching so tall they were almost all the way out of their skins. Now, what about this “disintegrated rock”? It’s true that most of the sand upon the earth comes from igneous rocks. These are formed when red-hot magma beneath the earth’s surface collects and hardens in small pockets underground, or when volcanic eruptions exhale molten lava that later cools. You can remember this, as I will from now on, by thinking of the word “ignite,” which has the same Latin root meaning “fiery.” Glaciers can mash these rocks down to crumbs, as a stale loaf of bread might fall to fragments beneath the heel of your hand. Even if this doesn’t happen, the rocks, exposed to the whipping, grinding, rubbing, licking touch of wind and rain—geology as foreplay—are bound to erode over time. Bits break off, and are blown or washed by the same wind and rain into rivers; the rivers, in turn, carry them to a sea or to a lake, polishing them into rounder and rounder grains as they go. But there are other ways in which sand can be formed, other materials out of which it can be made. On tropical beaches, vast stretches of sand are formed out of the calcium carbonate of crumbling skeletons and shells once belonging to marine life like snails, crabs, coral, and the beautiful, surreal unicellular organisms called Foraminifera that litter the ocean floor. This is sand as the fine, white ash of death. Sand can form slowly, gently, when minerals formerly dissolved in seawater lay themselves down in a crusty powder on the shore; it can burst forth in an intemperate rainfall of new granules when a falling meteorite violently liquefies the rock where it touches down on the earth. Even ordinary sand, “worn or disintegrated rock” sand, is full of multiplicity, pulsing with elemental force. Some grains, made of iron, are dark and heavy, like small black jewels; they hunger for each other and are drawn to magnets. Most, made of quartz, are light and bright, like bits of glass. If you could run an electric current through them, their piezoelectric property would cause them to expand and contract like minute beating hearts in perfect rhythm; you could tell time by them. We do tell time by them. To let a palmful of sand run through your fingers—some grains of which, perhaps, are billions of years old—is to hear all the stories of the ancient earth, if you only knew how to listen. 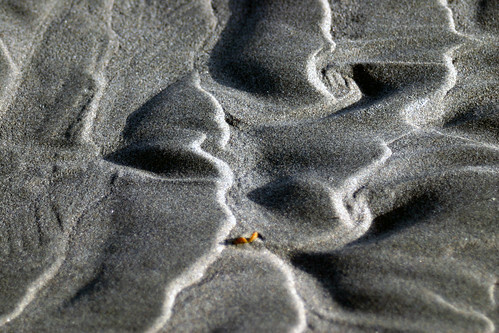 Then there is the way sand grows into beaches, the way such tiny things—maybe as tiny as 0.0625mm! But for sure no bigger than 2.0mm!—build whole vistas that stretch for miles, and the fact that this happens grain by grain. Waves deposit sand particles incrementally on the edge of the shore as they break. Waves steal a little sand back into the water, too, as they retreat—but unless they are very big waves indeed, they draw away less than they bring, because their gentle downward flow is weaker than their rushing upward push. I like knowing this about waves; their actions seem both ambitious and tentative. I think about the water pushing sand forward, pulling back, pushing forward, pulling back, and it reminds me that when you are trying to establish something new, it is okay if you take many steps along the way that seem to move you backward. It is part of the rhythm of creation to do so. And in this way, little by little, a beach is built like the one we stood on last Saturday. If ever there was a testament to the power of small individual acts to accomplish great things, it is not the acorn growing into a vast tree; it is sand, forming the universe out of specks. So much for beaches, formed by waves; as for dunes, like the bluff I clambered up, so vertiginous it took my breath away and left me marveling and dizzy, their story is of the wind. Once sand that has gathered on the shore has dried enough to blow about, a steady breeze moving in from the water shifts some of it further inland. It doesn’t take much force. A gentle zephyr of 9 or 10 miles per hour will do it—just enough to move the leaves in the trees or blow a twig lightly across the ground. The wind, after all, isn’t trying to move the whole dune into place at once. Grain by grain. That’s how the world is built. Breathed on by a breeze, sand moves in a funny sort of hopping dance called saltation, from the Latin saltus: “leap.” (Think of somersault!) The force of the wind gives each grain enough momentum to jump, in a shallow parabola, a little distance upwards and along; as one grain does so, it loosens other grains, which themselves bounce into the air, and so on and so on and so on. Eventually, saltating sand grains (I had to whisper that phrase aloud to myself just then; it was as lovely on the tongue as I imagined it would be) falling one upon the other form enough of a habitat for hardy beach grasses like reed and marram to grow in. It is these roots, at last, that stop the migrating sand. Without the roots, it would keep hopping forever, wild as sown oats. But moored by vegetation, the sand stops. It settles. It grows higher. Higher. Higher. And there it is, a dune. I love that. Something so stately, built out of a million grains of skipping, prancing, frolicking sand, given legs by the wind. Of course, a dune is no permanent thing. It reacts to its surroundings, changes its shape from moment to moment with the shifting wind and the heavy steps of those who walk upon it. I thought last Saturday of the dunes of rose and olive and ultramarine sand in Goab, the Desert of Colors. Goab is a place from my childhood. It is formed, in Michael Ende’s extraordinary novel The Neverending Story , out of the crumbling leaves and flowers of a fabulous Night Forest that dissolves into dust with the sunrise. The sands of Goab are new every morning, and yet their essence remains so much the same that the mighty lion Grogaman can find among Goab’s shifting dunes the very place where he stood the day before. Gazing down at my footsteps on the dunes, I wished to be Grogaman. I wished to know the sand that well. It is, I think, worth knowing. In the end we spent only a single day and night on the Michigan dunes, cradled in the courting cries of crickets and frogs, the laughter of friends, and the sputter and crack of our own warm fire. I wanted it to go on forever, to keep going to sleep beneath all that old light—the kind I can’t see here in the glittering nighttime of the big city. But there is this, and it is no small thing: Sand clings. It accumulates. It travels. It leaps into any space large enough (small enough) to hold it. So when I did get home, this is what I did. I tipped as many tiny crystals out of my sneakers as would have been required to build a hundred or more new worlds. I’m saving them, for now. You never know when you’ll need that kind of seed.